When our customers are thinking about features for their homes, many families create features with children in mind. Playrooms, separate bedroom areas, storage can all be altered to accommodate little ones. Many of our customers also share their lives with dogs and other creatures, but neglect to think about how their animals interact with both the people and their home environment. We spoke with Diane Barber, a professional interior designer in Rolling Hills, Calif., who works with her clients to as she says, “create harmonious living spaces for people and their animals.” Diane grew up in the construction business with both her father and grandfather building homes in Pennsylvania. She now has two design businesses, one that focuses on equestrian design built from a love of her horses and riding, and a second one that focuses on integrating pet spaces into their humans’ homes. The first thing she helps her clients assess is how they relate with their pets. Do the animals have free rein or are they limited to certain areas and pieces of furniture? Are there areas that are completely off limits? Identifying the ways people incorporate their four-legged friends helps her develop solutions. Diane has found that certain materials and fabrics can be incorporated into designs that make a home more animal-friendly and forgiving. She recommends using selective carpeting or area rugs over traditional hardwood floors, which can be difficult for older dogs with arthritis to find traction. Select washable paints like Benjamin Moore’s Aura® Paint that include excellent washability and a color lock technology that protects from fading and wear on trim or non-log wall areas in the home. For fabrics, she uses “contract” fabrics, which are specifically designed for commercial uses. With the explosion of high-end hotels and other commercial interiors, contract fabrics have taken on a new and stylish life. “The benefits of contract fabrics is that they are made with a high thread count, they have been tested for rubbing and durability, and often have Teflon incorporated into the weave to repel stains,” she said. One contract fabric company with fantastic selections is Duralee Fabrics. Dogs naturally prefer enclosed spaces similar to their aboriginal dens in the wild. So it makes sense to design little “niches” for dogs to sleep, eat and drink. In the kitchen, Diane has extended desk area countertops so that water and food bowls can be out of the way and less underfoot for humans. She also likes to incorporate “pet pantries” that provide efficient storage for all the accessories of canine life. She includes large sliding bins for storing dry dog food and extra bags, hooks for collars and leashes, sliding shelves for medications, treats, cleaning supplies and other dog essentials. 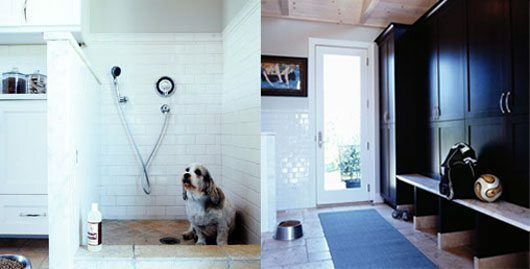 One smart addition for owners of active outdoor dogs might be a dog shower or bath area, located in a mudroom or laundry area. The shower might include an extra wall hook to secure a leash, lower shelves to hold shampoo and other grooming tools, and a hand-held nozzle attachment for reaching feet and bellies. 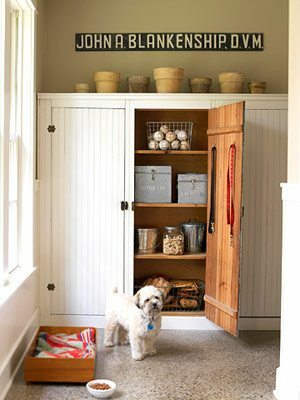 Adjacent shelving for “dog-only” towels and an easy clean surface of tile or linoleum makes all-season clean up a breeze. Tucking a sleeping area into a corner area can give comfort to both dog and owner, especially if dogs sleep in the bedroom. Fabrics for dog beds can be coordinated with other decorative elements to help to harmonize the overall feel of the room. Pay attention to lighting around dog-designated areas, as dogs are particularly sensitive to strong light, Diane said. A barrel spotlight above a sleeping area might be better located somewhere else, but a small nightlight nearby might help guide a thirsty pup to water in the middle of the night. Many people planning their log homes are designing for “aging in place” by limiting floor plans to a single floor, wider doors and showers and baths with extra grip handles. Diane suggests that you consider your aging dog as well—limit the stairs (especially up to the master bedroom) and provide non-slippery or carpeted areas for good traction. Even if their owners don’t suffer from allergies, installing some sort of HEPA filtration makes sense for dog owners. Diane has a room unit HEPA filter for her office area, where she spends most days with her dogs at her feet. Other considerations might include the bedroom or main living area, or a whole house system attached to the heating and cooling system. If your dog enjoys cooling off in the water, Diane suggests incorporating a small freshwater pool or fountain in your yard or patio area. 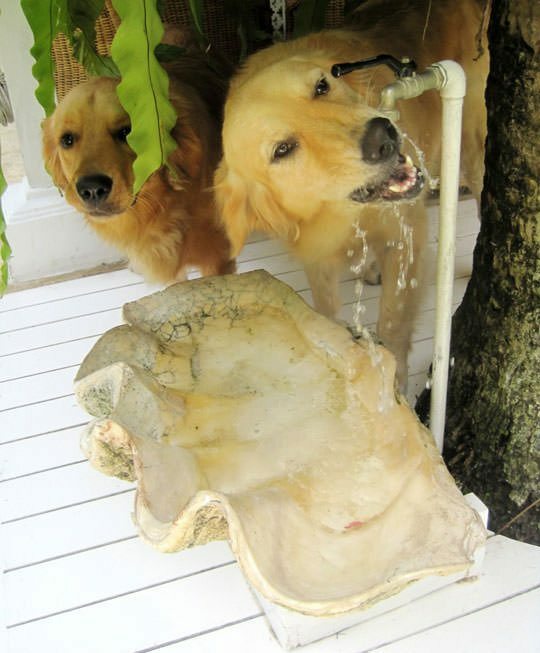 Dogs can cool off or get a drink when they get too hot. Including some shade in the yard when the sun is highest is also important if your dog spends a lot of time outside. One way to provide additional shelter for outside dogs is a dog house. 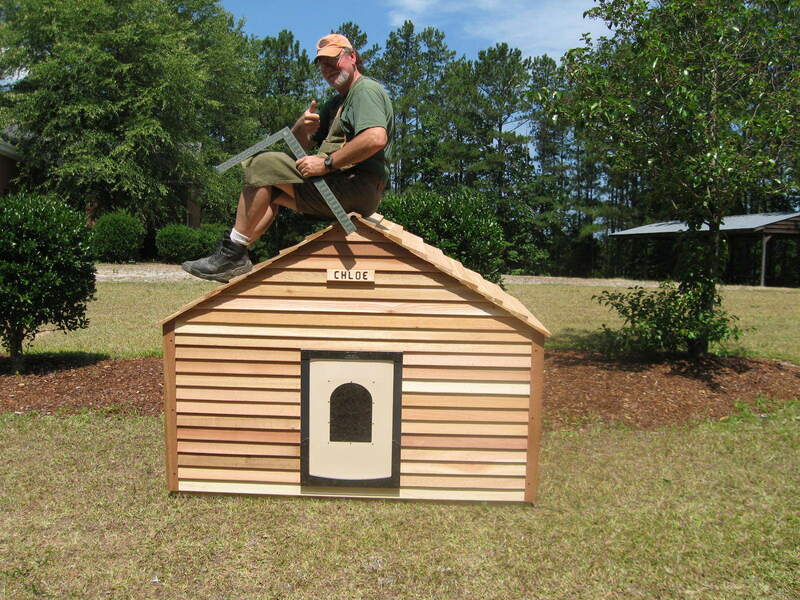 We found some terrific cedar dog houses in South Carolina built by Blythe Wood Works. Chuck and Dinah Keeton have been building their sturdy red cedar dog houses since 1990. They handcraft dog —and cat— houses that are designed to last, with solid framing and cross bracing to withstand the elements and keep pets safe and dry. The designs range from small houses with single doors to larger mini homes with two entrances, porches and custom designed self-sealing doors. The units are pre-constructed for easy shipping and on-site assembly. Their website offers tips for sizing the dog house to fit your dog and explains what configurations are available. For dog owners who live in warmer climates where daytime temperatures can reach 100 degrees, Blythe Wood Works also have a DogAire™ 5100 BTU cooling system. The unit has energy saver controls, an on/off timer and a one-year parts and labor warranty and 5-year compressor warranty. The unit can be installed in less than two minutes and their dog houses can be configured for the units at no extra charge. Both our experts agree that spending a little extra to ensure their dogs’ happiness is a worthwhile investment, considering the return of unconditional love.